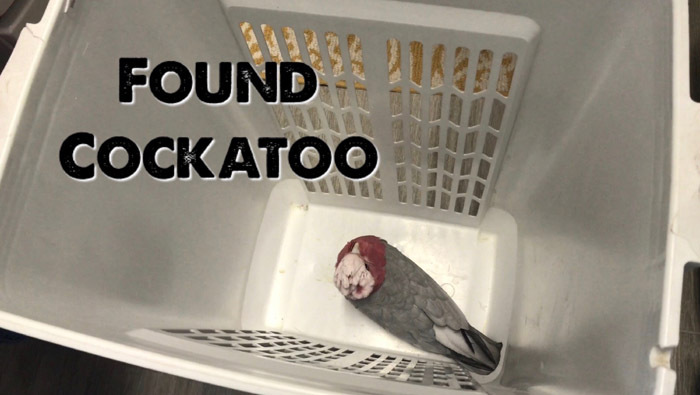 During my two recent trips to Ginger's Parrot Rescue in Casa Grande Arizona, I got to see first hand the winding story of the lost and found Galah. I was visiting the rescue on my first trip to help get things set up for the new facility grand opening event and then I returned in a week with my birds to give presentations at the event itself. While this was all happening, a mysterious Galah came into our lives. 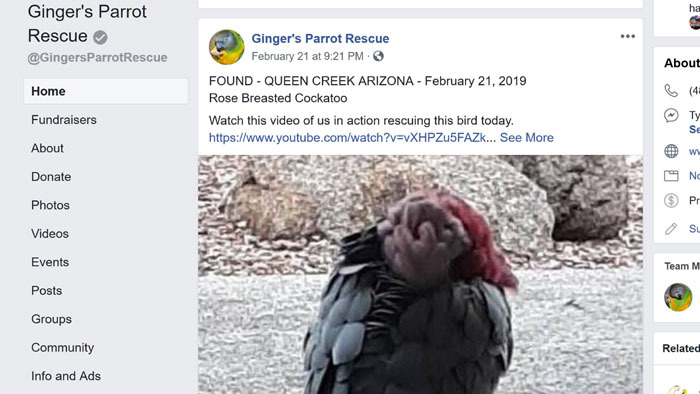 On the cold rainy morning of February 21, 2019, while out shopping for supplies, Ginger received a phone call from a lady that spotted a parrot outside her window. She described the bird as being "grey with a red mane". Ginger was not completely convinced that it was a parrot and worried that it may have just been one of the feral lovebirds that are frequently spotted in the valley. Ginger asked the woman to text her a photo of the bird and the moment she saw the picture, Ginger knew right away that it was a Rose Breasted Cockatoo (Galah). We dropped what we were doing and started to drive to Queen Creek. Already on the road, Ginger was instructing the woman who found the bird on how to try to catch it. By the time Ginger would get to the neighborhood, the bird could be long gone and impossible to find so it was very important to either catch or keep an eye on it. The woman called Ginger back and told her that she managed to catch the bird but that she was leaving in 15 minutes to the airport for a flight! She asked her mother-in-law to come over and wait for Ginger to come and pick up the bird. Ginger was caught a bit off guard because she was out shopping and did not have a carrier to take the bird in. So, she stopped by a pet store and bought a carrier to be able to transport the found parrot in. When Ginger arrived to the house, the mother-in-law was waiting and showed the bird being held in a laundry basket. Ginger swiftly picked up the bird and discovered that it was really emaciated by the protruding keel bone. She wasted no time in getting the bird an emergency visit at the local avian veterinarian. Once the parrot was stabilized by the veterinarian, Ginger set about the task of reuniting the parrot with its rightful owner. At first, it seemed like a pretty easy task. Ginger came across a few lost Galah ads online and thought it was likely it was one of those peoples' bird. But pretty soon things started to get more crazy. Ginger's phone was going off all day with calls from people saying it could be their bird. To make things even more confusing, some people messaged and called which made Ginger feel even more overwhelmed as though there is an even greater number of people who think it is their bird. Some of the potential owners were weeded out more quickly. For example, some stated that their bird had light eyes indicating that it is a female whereas the found Cockatoo had dark eyes indicating that it is a male. Other people were just way too far away, like out of state. Pretty quickly, Ginger narrowed down the list to just a few people that could legitimately be the parrot's owner. However, the bird was still in dire condition at the vet's office. It was still being given fluids and was weak and tired. It was unlikely that the owner would be able to recognize the bird because of how bad it looked and how sedate it was. Ginger had to postpone any meetings with potential owners until the next week in order to give the bird time to recover. Ginger and I went to check up on the bird over the weekend and found it to be better but still pretty rough. He had started eating but looked tired and sedate. He seemed more indifferent to our presence than interested or scared. A few days later Ginger got a call from the vet that the Cockatoo was doing better and was moved into the room with other boarding birds. However, the Cockatoo did not seem interested in other birds or people. At this point, Ginger started setting up meetings with some of the people who had recently lost a Galah to see if it is their bird. Ginger had those people come to the vet office to see the Cockatoo. Ginger wheeled the cage into the visiting room and had the possible owner interact with the bird. Ginger was trying to see if the bird would make any known vocalizations, show a reaction, or step up for the person. Unfortunately the Galah was not responding to the people who would come to visit. In fact it would try to retreat to a distant part of the cage and absolutely would not step up. It was clear to both Ginger and the folks who came to visit that it was not their lost Galah. I went back home to prepare to come back for Ginger's big event while Ginger continued the search for the rightful owner. Proving ownership of the bird was proving to be a difficult but important task. Without a microchip or leg band, there was no simple way to prove that someone owned the bird. Ginger was afraid that someone could lie that it is their bird so that they could claim and then sell it. This is why Ginger had to be a bit secretive and tricky in order to avoid any potential scammers. She asked callers particular questions that might help identify the bird. With the bird in better condition and no owner found, Ginger had to take the Galah away from the vet and back to her rescue. She set up a large cage and continued feeding the bird well so he would regain weight. Ginger was becoming less optimistic about finding the original owner and was beginning to plan to search for an adopter once the 30 day owner search period was over. I flew back to Arizona for the big event. This time in my airplane with wife, birds, and supplies. The new facility grand opening event and open house were a huge success. People from all over the Phoenix area came out to see the new rescue. Many of them marveled at the Galah and wished him a good home. Then, one day before I was scheduled to depart, an incredible thing happened! Ginger got a call from a woman who was already on her way to pick her son up from school to come and see if it was their lost Cockatoo. When Ginger heard that they had lost their parrot 2 years ago, Ginger's optimism waned and she didn't want to waste their time. However, in half an hour they showed up at her door and were convinced there was a greater calling that brought them there. From the moment they walked into the room, the Galah seemed to perk up. For the first time since we met him, he raised his crest. Not all the way, but it was more than any time prior (even when we tried to get him excited). He let out a few chirps but was otherwise pretty calm. Ok, he seemed alert but maybe it was just because of visitors and by now all the meds wore off. 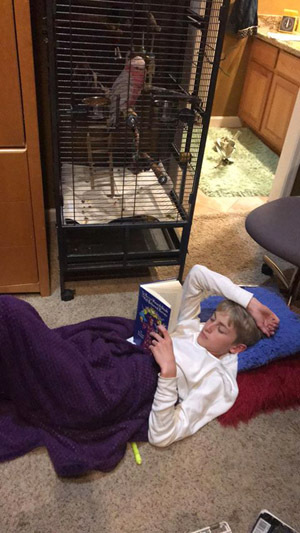 The boy went up to the cage and the bird did not seem scared. At first, the parrot just watched but soon he started to come closer. The mom went over to the cage and showed a video of her son playing the harp. The bird seemed curious but for all we knew, it could have been curious about any music. But then he walked up to the edge of the cage and gave the mom a kiss! He had not made contact with anyone else including the vet, myself, and Ginger! Soon after, the bird was giving kisses to the boy as well. And before long, with the door open, the Galah came out all by himself! He stepped up onto the mother's hand and recognized his carrier that they brought with them. It was the bird that recognized and showed us who his owner was! The family got the Galah, named Echo, as a baby and he was just 1 year old when he flew out of a window. He had been missing for 2 years. It was amazing that he had spent more than 2/3 of his life away from them but that they were the only people he responded to. However, after bring apart so long and growing up as such on his own, there would be a lot of work getting him back to being tame and good with people. So, I gave them a signed copy of my book, The Parrot Wizard's Guide to Well-Behaved Parrots to help them rekindle their relationship. They took Echo home that night and he immediately recognized his cage and went to his favorite perch. So if you or anyone you know has lost a pet, never give up! There is always a chance that it will come back to you. 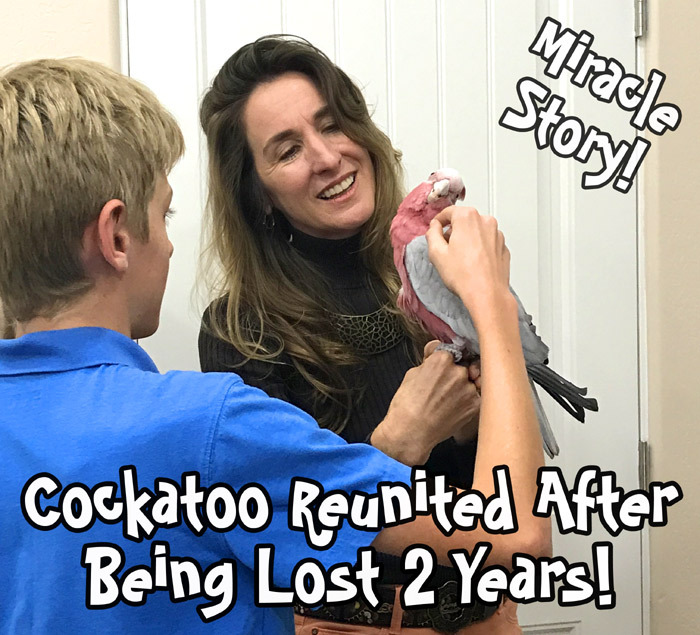 Here is the story of one such miracle of a Cockatoo that was lost for 2 years and ended up back with his family! Here is a first hand narrative from Danna Goldman, mother of the boy Kaden and owner of Echo the Galah. Kaden saved for years to buy a Parrot. June 2017 he purchased a Rose Breasted Cockatoo hatchling he named Echo. Feb 18th 2017 Echo got out and we couldn�t find him. Kaden felt God assure him the He was going to bring Echo back and that Echo wouldn�t die�just didn�t know when. Two years later, Echo was found, and we miraculously got him back! Echo is still shaken but content to be back in his cage and home. 2. A young friend of the family (9 at the time) had a prophetic dream that Echo would come back. She described the place as beautiful with trees and a mountain in the background with a beautiful sky � like heaven. Kaden walked up and called to Echo from a tree and Echo came to him. She said it was confusing because Kaden looked and sounded a lot older. 3. I had gotten desperate in my prayers to God, trying to hold onto Kaden�s faith but begging God for clarity and help. It was quite hard to see my son so sad missing his bird and waiting for him. God clearly spoke the verse: Lamentations 3:26 �It is good that one should wait quietly for the salvation of the Lord� because of that word from the Holy Spirit I too attained the peace that God would bring the bird back in His perfect timing. 4. A year had passed. Kaden would get reminded every now and then of Echo and get so very sad. My friend Lauren was visiting one of those times. She was pained by seeing his pain. She hears God clearly and He speaks almost fluidly to her. I asked her to ask God what He�s doing with this situation. She went and prayed and talked with God. She came out and said, �God said he (the bird) is still alive, and the wait is for Kaden�s faith.� Again, we got another boost to keep our faith strong. 5. One day I was struggling with worry over Kaden and crying my fears out to God. In that painful moment God gave me a vision of understanding that He was going to use Echo to help Kaden in his faith so I need not worry. Again I could rest in His assurance. 6. March 13th 2019 as I was praying in the morning, I was hearing the rain and wind and I was so sad for Echo being out there. I felt urgency to check social media yet again. I connected with one rescue that connected me to the rescue where they were caring for a male Rose breasted Cockatoo! 9. There was a possible sighting by the mall: circled the mall walking and driving, calling, playing the Galah calls, brought flyers. Not allowed to post flyers so talked with the security manager and gave them the information and they posted in the breakroom, same with Coolidge and Casa Grande PD. I also had friends who labored in prayer as the Spirit led them. Lauren, Nichole, Petra, Abby, and Joy in particular kept the faith with us and didn�t (seem to) doubt. God is real, faithful, in control, can use anything to reach us, communicates with us, and most of all LOVES US! That bird was a tool to touch Kaden and many others. One of my most frequent prayers for Kaden has been for him to hear God�s voice, to know when the Holy Spirit is leading him. He had a remarkable moment after that one aforementioned prayer. Now he knows THAT PEACE was the Holy Spirit and will be able to recognize His leading again and again. He also knows God does what He says he will do and is who He says He is. It was truly a miracle that the bird lived out there for two years and was returned, it was an impossible situation made possible by God and God alone. In August, 2015 I traveled to Australia on honeymoon. We got to see many parrots and other animals around that beautiful country. 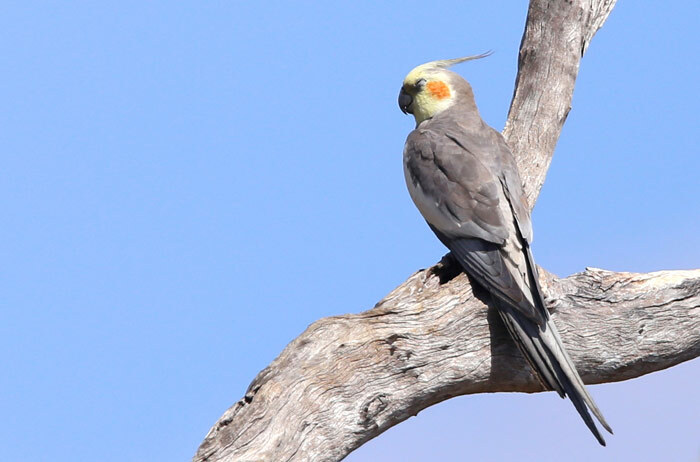 This article is about the wild Cockatiels and Galahs we saw in the vicinity of Pine Creek in the Northern Territory. We made two sightings of wild Cockatiels. The first was during lunch by the lake at Copper Dam. The distinct call of Nymphicus hollandicus came through the air as a handful of Cockatiels flew by. I followed them with my eyes as they landed in a dead tree across the lake. Some more Cockatiels arrived and they congregated in the tree. There were around a dozen Cockatiels in total. They spent a few minutes in the tree alternating circling flights with rest. Cautiously, several Cockatiels flew down to the shoreline. A few quick steps and they were wading at the waters edge. More came down to join them. They didn't spend a whole five seconds on the ground before they took flight back to the safety of their tree. The same Cockatiels repeated this drinking endeavor at least three more times. Most of the cocktail party departed but a few Cockatiels stayed for a nap in the tree. The Cockatiels were too far and too quick when flying for water, so I was not able to get any video of the process. But here's a video of them in the tree and a photo of them getting a drink. The second encounter with Cockatiels came on the morning of the following day. Driving from Pine Creek back to Darwin, we spotted Cockatiels foraging on the ground by the road side. I approached them slowly but it was disturbing their feast. I couldn't get close enough to get footage and a few steps closer and they flew off into a nearby tree. Much like the Cockatiels at Copper Dam, these birds were very cautious on the ground. The birds spooked and went into the tree. I took this as an opportunity to get closer and station my gear hoping they would come back. They watched from their high vantage point for the danger to subside. A few brave birds came down first and then the rest followed. I would discover that I wasn't the only reason they'd take off to the tree. Every few minutes, the whole flock would fly back to the tree for a bit before coming back. What was even more interesting than watching Cockatiels feeding on the ground was to discover that Galahs were amongst them! The two different species of Cockatoos would remain in their own distinct factions, but in very closer proximity to each other. 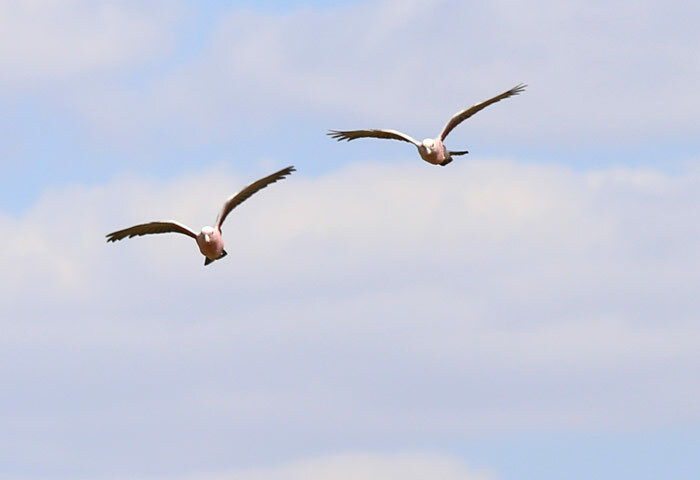 In fact, when the flock would launch, they would both fly back to the same tree together. 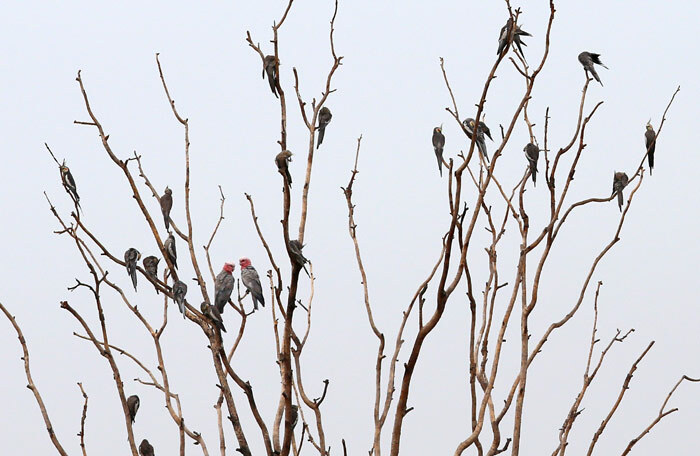 There were about two dozen Cockatiels for the half dozen Galahs. The large flock was visibly subdivided into smaller group units. We could hear Red Tailed Black Cockatoos in the distance but they did not mingle with the Galahs and Tiels. The Cockatiels scurry around the ground on quick legs. Some birds look up while others have their heads down eating. But here's a fascinating thing. They are absolutely quiet while eating on the ground. It makes perfect sense, but it is the polar opposite of the endless Cockatiel chatter you hear when they are flying or perching. 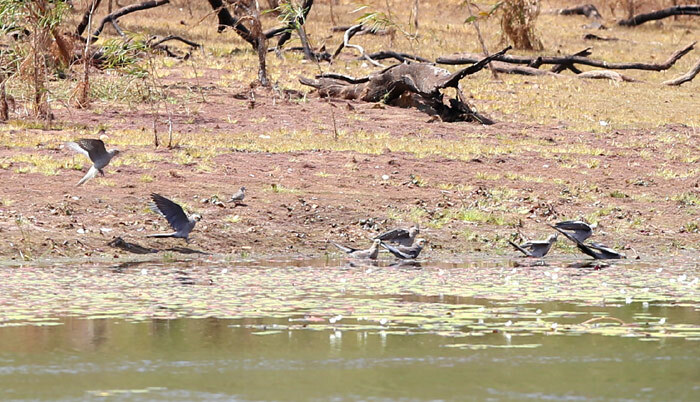 It was an amazing experience to get to see these birds in the wild and what they do. It makes me appreciate them even more as pets and I hope that we can learn a bit from their wild habits and apply that knowledge toward making our homes an even better place for them.